I generally agree with your list of Mid-Bossier Shale completions but believe the inclusion of the Black Stone Min 12 H1 Well is in error. You will note this well was identified as a Haynesville Shale completion on the EnCana slide with the graph of various Mid-Bossier Shale production rates. Also, what was the information source that identified the last four wells plus the Greer 15 #H1 on the drilling list? Thanks for the input. I'll take a look at the Black Stone well this afternoon. Robert, I have doubts that the Range Resources-Horton Federal #1H (Sabine County) was/is being drilled. I can find no mention on either Baker Hughes Rig Map or on my subscription service of a rig in Sabine County this year, other than on the Hall #1. I will verify shortly, if I have to drive up there myself. Don't waste the trip. I only have it on the map in the permitted/drilling category. It is only permitted and is not drilling at this time. Maybe it's confusing, but I lumped the two together to make it "binary" - i.e. completions vs. non-completions. It made it easier to keep the map relatively current. 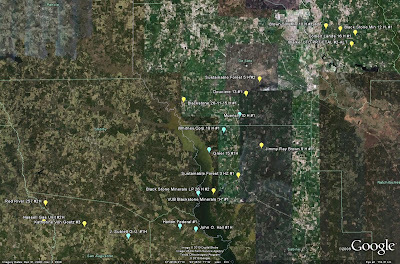 There are a couple of other wells that I know are out there that are either drilling or completed but haven't narrowed down to the exact locations. One in Texas is an EnCana well in San Augustine Co. I think either Black Stone Unit A43(687761) or Black Stone Unit A398 (693088) is a Mid-Bossier well. Any thoughts on these? Black Stone A-398 is still drilling about 3.5 miles NE of the BS A-43 @ 31.453050, -94.223522 and the Horton Fed. is just a permit... but it is a nice drive.